Isn’t it time you took a break from World of Warcraft and won jackpots with dragons? Dragon Kingdom is the latest online casino slot from Playtech. Isn’t it time you took a break from World of Warcraft and win jackpots with dragons? 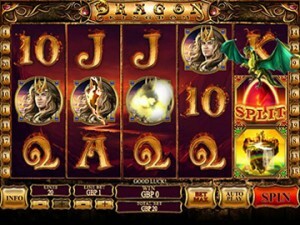 Dragon Kingdom is the latest online casino slot from Playtech. A 5 reel, 20 payline game, Dragon Kingdom is based on fantasy roleplaying games. The symbols include a wavy haired prince who needs a haircut (he looks like Peter Frampton from the Sgt. Pepper movie), a tough looking princess and a green dragon that isn’t named Puff. Match 5 green dragons for a 25,000 coin payout – quite a jackpot! When the Split symbol appears anywhere on reel 5, you’ve earned your way to the Dragon Split Feature. The last symbol in any winning combination splits into 2 and they both count as 2 identical symbols. This means you can now match 6 symbols together and win even more payouts! The yellow Castle in the Sky symbol is another one to watch. Match 3 or more anywhere on the reels and you’ve won 15 free spins with a dynamic multiplier. You start off with a multiplier between x2 and x5. After every winning spin , your multiplier goes up one, and for every non-winning spin, it goes down one – but it can’t go lower than x2! Slot, video and casual games have been coming together at the intersection of “fun and games” for years now and Dragon Kingdom is yet another step in that direction. No, you’re not likely to see video games with 7’s and cherries. But you are seeing a blurred line between entertainment and gambling. Is Dragon Kingdom an RPG slot? Is it pure gambling? Or is it a video game that allows small bets? You get to decide!